Easter is just around the corner! Although I don't celebrate Easter in my house, I do go out and buy something small for the girls. The past few years I have been doing a small hamper for them both but this year I think I may just buy a cheap easter egg and then take them out and treat them to a small toy and new shoes each because they are desperately in need for new shoes! There are many gifts out there that you can treat your child to, other than chocolate! Although most of us love chocolate, it can get too much when the rest of the family and friends buy Easter eggs too. 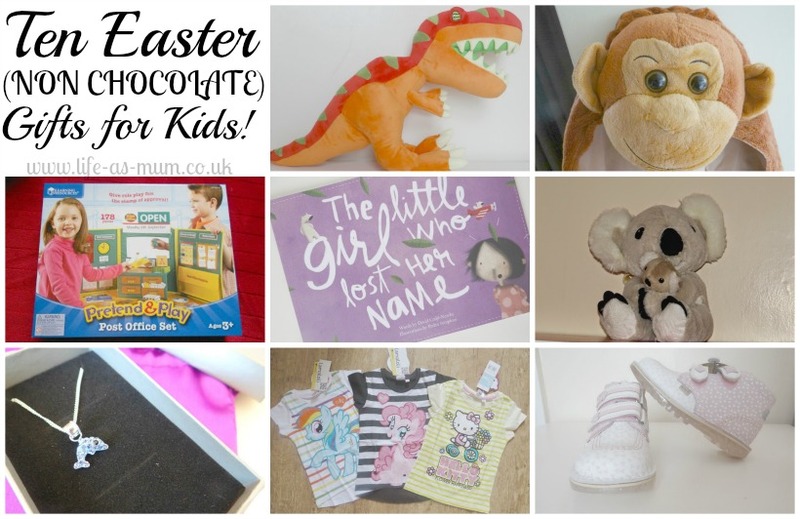 I have gathered a few items I have reviewed in the past and rounded them up in a Ten Easter (Non-Chocolate) Gifts for Kids! My First Jewellery - If you have a little girl who loves her jewellery then My First Jewellery is a brilliant company who sells beautiful jewellery for little girls. Their jewellery are so pretty I am sure you little one will fall in love with it instantly! This could also be a great keepsake. Jungle Plush - If you have a dino lover in your home then this is the teddy/toy for them! My youngest is obsessed with dinosaurs and when the plush arrived she instantly fell in love and still loves it to this day. The quality of this plush is fantastic and will definitely last. Miss Mane Hair Accessories - Do you have a child who loves getting their done up daily or most days? Or a child who's hair is just starting to grow? Miss Mane's hair accessories are beautiful and at an affordable price too. New Shoes - New shoes is a must for most children! Most shoes get scrapped pretty quickly. Get The Label have fantastic prices on shoes. Nearly every child loves a new pair of shoes or trainers. Lamaloli Clothing - Again, the same as shoes. Clothing is just as exciting as shoes! Maybe for some kids clothing isn't, but Lamaloli offer great character clothing and I am sure your child will love them. Fantastic prices. The Girl Who Lost Her Name Book - This book is perfect for any child who is learning to spell their name. This book all rhymes and is a fun book to read during the day or as a bedtime story. I am sure you and your child/ren will love this book once read. Pretend To Bee Cape - Most children love to dress up and dressing up/role play is so important. It's where they can use their imagination and be a child like they are supposed to be. Post Office Set - Ever since we received this great post office set my girls have loved it. There are so many things children can learn with this post office set. They are learning but also they are having fun and enjoying playing postman/woman. Go Out For A Meal - If you don't fancy buying any gifts, why not visit a restaurant and go out for a meal just you and the kids or you and the rest of the family.